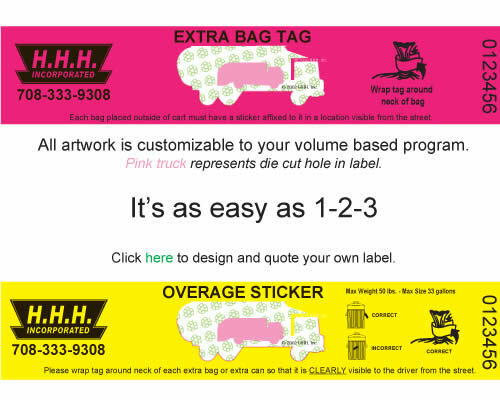 Extra bag tags and Overage stickers are for hybrid volume based programs where there is a set amount of trash or yardwaste included in a resident's pick up allowance each week. All front and back text is customizable on these stickers. If you don't see the clip art you need on one of the pages of this site, just let us know what you need an we most likely already have it available for insertion into your label design. Stop Label Counterfeiters Tip - The most common sign that a resident is counterfeiting stickers is the use of clear packing tape to adhere stickers to his or her family's trash bags or bins.